‘DEAR Tun Dr Mahathir Mohamad. Firstly, congratulations on your win in last week’s general election in Langkawi. At the ripe age of 92, you have risen the bar in so far as public service is concerned. Congratulations, too, on the overall victory of Pakatan Harapan at the polls. Your coalition, under the banner of PKR, is the government, tasked with managing the country after a bruising and divisive campaign. Your task is by no means small and easy, as you would agree and realise. In the general elections of 2008 and 2013, the nation also went through robust and bruising battles. You were not a major player in those elections. You played your role as a supporting actor then, taking bit parts during the election run-up. This time around, you decided to run for office. And won. And reclaimed your office in Putrajaya as the country’s seventh prime minister. It is a personal history for you and a national one for Malaysia. Pakatan Harapan has listed several priority items that would be implemented within 100 days of forming the Federal Government. I won’t go into that list here, but all of us will be scrutinising it every day. I don’t have to remind you that promises are to be kept, Tun. Your administration’s credibility would partly rest on that list. In fact, that list would be the KPI (key performance index) by which the rakyat would partly measure you and your team. It’s early days and there’s time for you to sort out your team and get things done. But, one item I’d like to highlight is national reconciliation. There were talks of national reconciliation after the 2008 and 2013 general elections, but they remained just that — talk. There were many reasons for that of course, but we can’t afford to have a nation so polarised and divided. If we need to take our rightful place in the world stage, we must get our act together. As a medical doctor, and having had the benefit of being a prime minister for 22 years from 1981 to 2003, you must be eager to get back to work. You have been out of government for some 15 years, though you never stopped being a politician. 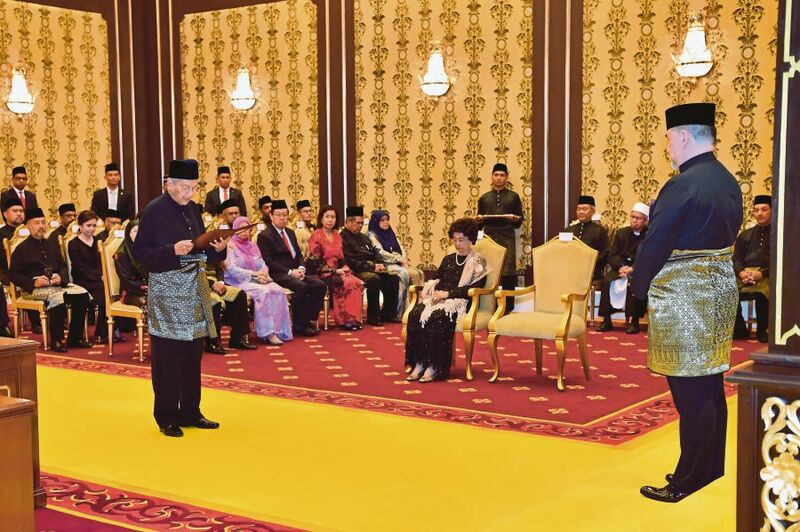 And now that you are back at the forefront of national administration, I’m quite sure you are eager to bring the knowledge you had acquired while you were outside to Putrajaya. We wonder what new approaches you and your team would bring to the high office. Take it from me, once you have been on the outside, your perspective of things changes. But, one matter that has triggered considerable excitement is your declaration that the rule of law would be central to Pakatan Harapan’s administration. You seemed to suggest that the rule of law have been somewhat wanting. We await your elaborations after you and your cabinet have settled down. You need to stick to the proper execution of the rule of law, and bring back the dignity in the administration of these laws, too. We can’t have double standards in matters pertaining to the rule of law; in the same manner that the upholding of all instrument of justice must also be just and true. Tun, the national political landscape has been turned upside down. It started in the 2008 general election when Barisan Nasional lost five states, a feat that was followed in the next general election. Politics have taken too much of our time, Tun. Governing the nation and its resources require focus and undivided commitment. Once the posters, banners and flags have been taken down, everyone’s attention is towards governing the country. I’m told you are a man in hurry. Your cabinet and you must get down to work immediately. I know, I know — you and your team have not had a proper break for weeks. But I know you are not complaining since the adrenaline is pumping! It’s the same with the state governments under your coalition. Tun, the rakyats have simple demands. They want an efficient administration; friendly and approachable; solve bread and butter issues; provide security for everyone; jobs; a media that is free to report; living costs that are manageable; and, equal opportunities for small and big businesses.